Tile simply refers to any kind of durable material that can be laid in rows over a surface. People have interpreted that to mean anything ranging from broken seashells to solid gold, for kitchens and bathrooms it most commonly refers to ceramic, glass, porcelain and stone. However, what may be best for your kitchen might not work effectively for your bathroom. How can you be sure that you’re making the best choice for each specific location? Like most problems in design, this is an issue of functionality and practicality. Deciding on where the tile will be placed will help you narrow down the size and materials to be used. Are you using the tile for counters, floors or walls? The most common choice for counters and floors are ceramic, porcelain and stone. For walls, glass is mostly used. For showers, opt for a ceramic mosaic floor (which provides a solid grip in an otherwise slippery shower), accented with low-maintenance rectangular glass tiles. Glass tiles are a common choice for kitchens and bathrooms today, mostly because they’re easily recycled and come in a wide variety of colors and finishes. Mosaic tiles are usually shaped in rectangles or squares and have become increasingly popular. Remember that a glossy floor tile isn’t the same as a glossy wall tile. Before buying, explain to an in-store expert where your tile will be installed. The floor tile has to be safe to walk on, so you’ll want to make sure that the texture and strength of the tile are correct. A no-slip grip coupled with incredible strength make porcelain a common flooring choice. This is an extremely durable and water-resistant material that can be used even outside. 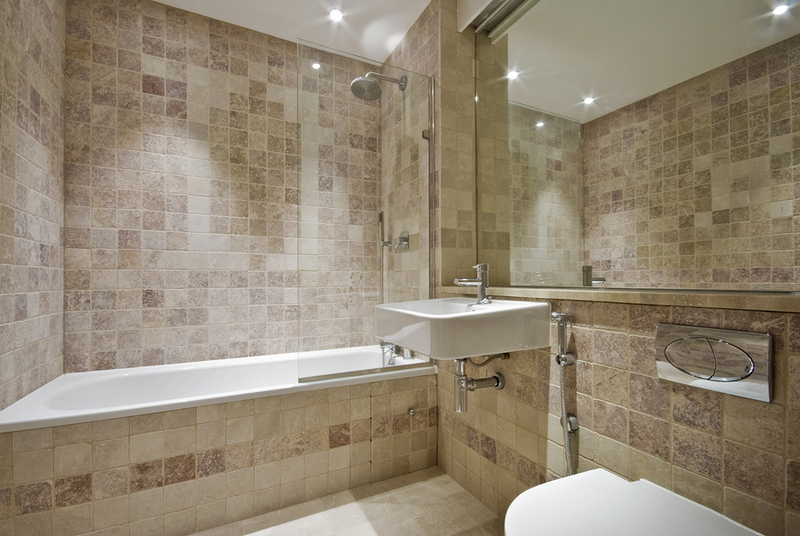 Meanwhile, ceramic tile is a good fit for bathrooms or other moisture-rich environments. Proving easy to clean and install, it’s also waterproof and sturdy for the price. Designers also prefer working with ceramic tile because the surface is ideal for paint, or decal ornaments. If you’re looking for durability, however, natural stone can’t be beat. It has complete natural beauty since no two stones are exactly alike. However, you should pay attention to maintenance requirements when choosing stone. Some stones need sealing; otherwise, they may stay porous and can become stained or can even crumble. Smooth stone works well for kitchen clean-ups, while textured stone will help prevent slips on a bathroom floor. This is particularly important if you're planning to install the tile yourself. Larger tiles have a distinctive look and are easier to fit and place than smaller tiles. If you're using ceramic tile, check that all the edges are straight; this will make grouting much easier. Also make sure that all of your tiles are the same size — the manufacturing process can result in variations up to 1/4 of an inch. Rectangular and square tiles are also much easier to place than those with irregular shapes. Porcelain tiles with mirror inlays are absolutely stunning, but if this is a look that you prefer, it’s a good idea to call in a professional. It’s important to choose floor tiles that can stand up to the daily wear and tear of your household. Spilled food, scuffs, cleaning supplies, pet scratches, etc. should all be taken into account. Make sure to choose tiles that are specifically formulated for floor use. Remember that something with a slight raised pattern or texture will increase friction, even when wet. Whichever tile you choose to use for your home, we at Dust Commander have you covered. We specialize in giving you the best service without tearing a huge hole in your wallet, and specialize in dust-free tile removal. If you’re in Texas or within the surrounding areas, don’t hesitate to give us a call at 903-357-4640. Our operators are standing by to give you a free, no-obligation estimate!